Who would have thought making a dip was so easy ... lol ... i have always bought dip thinking they were too hard to make. Well i was wrong. Last night for dinner we had Lamb and Feta Kofta with Beetroot Tzatziki, and we all loved it. I don't imagine that this is the authentic recipe given that it uses canned beetroot, but it turns out so yummy I am sure we can gloss over that part .. ENJOY ! 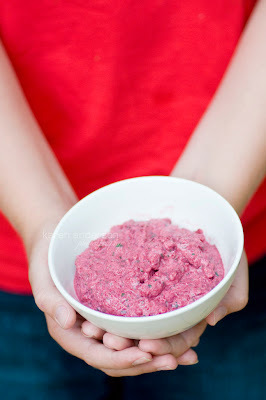 Process the beetroot, yoghurt, mint, shallot and garlic in the food processor until smooth. This may be the first thing I try when we get back...yum. Then it will be the pesto. Double yum.